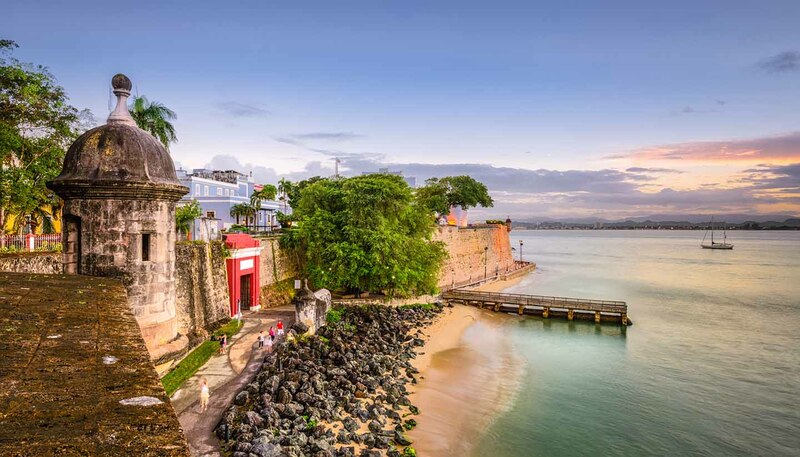 Think palm-fringed beaches, colourful colonial buildings and a harmony of Caribbean, Hispanic and American cultures, and you’ve got Puerto Rico in a nutshell. A coconut shell, of course. Add to this swathes of tropical rainforest, warm turquoise waters and year-round sunshine and you have all the hallmarks of a perfect holiday destination. Most visitors flock to Puerto Rico to bask on its pristine sands. From Rincón’s rip-roaring swells to the nearly deserted shores of Vieques where wild horses roam, there really is sand and surf for every type of beach bum. Puerto Rico also has three rare bioluminescent bays: glow-in-the-dark bodies of water that produce a nighttime lightshow for kayakers and boat tours. Inland, epic landscapes and cultural attractions abound. The central mountain range is riddled with limestone caves and rugged forest trails. El Yunque National Forest, by contrast, is a lush expanse of rainforest, with waterfalls and Taino petroglyphs. The Conservation Trust of Puerto Rico's various sites offer visitors a taste of the island’s colonial history, including Hacienda Buena Vista, an old coffee plantation, and Hacienda Esperanza, an old sugar plantation. Culturally, Puerto Rico integrates three “roots”: Taino (an indigenous group), Spanish and African. The country is in the Caribbean, but not wholly of it, influenced also by Latin America and the USA, with which it has a colonial relationship. The American influence is visible through ubiquitous US flags, shopping malls and basketball, the national sport. Historical Spanish influences are well preserved. Old San Juan is home to two UNESCO World Heritage sites, with blue cobblestone streets and pastel-painted colonial buildings. This blend of cultures makes for interesting music, food and festivals, as well as some quirks of daily life (the Spanish and English languages are fused resulting in some interesting names). Preserving cultural heritage is what Puerto Ricans do best, and it’s what draws visitors back again and again. That and the beaches, of course. 8,870 sq km (3,425 sq miles). Self-governing US Commonwealth Territory (incorporated). President Donald Trump since 2017. Governor Ricardo Rosselló since 2 January 2017. Most visits to Puerto Rico are trouble-free but you should be aware of the global risk of indiscriminate international terrorist attacks, which could be against civilian targets, including places frequented by foreigners.